Hellll no is Melania Trump continuing to look good throughout this presidency, boycotters have told Dolce & Gabbana. 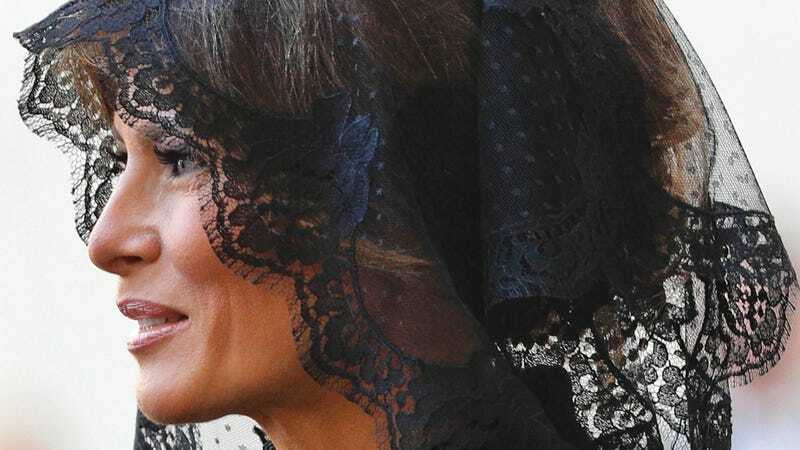 The designers–responsible for such garments as the black doily she wore to see the Pope and the $51,500 coat for the G7 summit–have been shamed on social media for continuing to dress the first lady while other designers will not. Several others like Marc Jacobs, Phillip Lim, and Sophie Theallet (who dressed Michelle Obama) have come out strong against the Trump agenda. Commenters are mainly offended by Dolce & Gabbana’s massive price tags while the president’s policies would cut funding to disability payments, food stamps, public schools and leave 23 million people without health care. Among other things. Some critics would just like to state for the record that Michelle Obama took flak for wearing $540 sneakers to a food bank. The comments section is about an even mix of heart emojis and poop heads. @FLOTUS is officially a #DGWoman, THANK YOU.